All Catholics have a primary responsibility to act according to their own consciences. Not the conscience of a bishop. Not the conscience of a parish priest. Not the consciences of neighbors or family members or employers or friends. Your own conscience. You are answerable to God for your own actions. No one else’s. F.Y.I. — On Oct. 30, National Catholic Reporter explored how, during every election cycle, voter guides advise Catholics how to vote based on the “intrinsically evil” concept in its editorial, ‘Intrinsically Evil’ Canard Is a Deception. Fr. 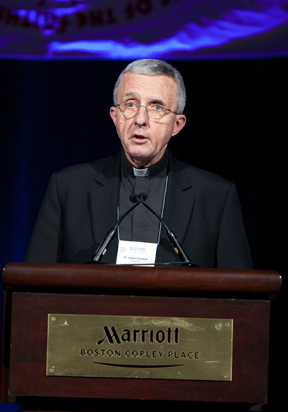 James Connell addresses Voice of the Faithful 10th Year Conference, Sept. 15, 2012, in Boston. Cardinal Schonborn was being interviewed on Oct. 23 by John L. Allen, Jr., of National Catholic Reporter during the Bishops Synod on the New Evangelization in Rome. And so John L. Allen, Jr., began his Oct. 24, 2012, National Catholic Reporter blog, Transparency on Money and the New Evangelization. Financial scandal, like the scandal of clerical sexual abuse, is enabled by lack of transparency. Voice of the Faithful® has said as much in its Financial Transparency and Accountability paper distributed last month at its 10th Year Conference. Recent revelations of child sexual abuse and cover-up in the Roman Catholic Church in Australia and the Boy Scouts of America show the depth and breadth of this continuing worldwide perversion and scandal, according the Church reform movement Voice of the Faithful®. According to media reports from the state of Victoria in the southeast corner of Australia, a recent parliamentary inquiry found 620 cases of abuse since 1956 that the Church had not reported to police. This underscores the worldwide nature of the scandal that, only a few years ago, was purported to be only an American problem. Police slam Catholic Church over abuse | The Australian. How do we evangelize those who have been deeply hurt by clergy who have been involved in sexual abuse? Jesus dealt with those who were disillusioned by listening attentively to the stories of the disciples and leading them to a new awareness of his presence. This example of Jesus shows that the new evangelization, which must happen in the midst of the sexual abuse crisis, occurs in at least four different ways. Provide real opportunities of listening and discerning together to appreciate the depth of hurt, anger and disillusionment associated with this scandal. This listening ministry could become a part of every diocese in the form of an office of mediation where people could bring their hurts and seek appropriate reconciliation. Consider the reasons why this crisis has happened. Put into place measures which will create safe environments for children and all who are vulnerable in the faith community. A spirituality of communion must permeate all relationships and structures within our parishes and local churches, through a consultation that brings people together, acknowledges the presence of God’s Spirit working in the members of the community and assists in responding to those who feel that their voice is never heard in the Church. Support co-responsibility by bringing change in certain structures of the Church and in the mentality, attitude and heart in the ways of working closely with lay persons. These changes could include the appointment of pastoral teams consisting of clergy and laity, an official reflection on and recognition of lay ecclesial ministers, a deliberate and systematic involvement and leadership of women at all levels of Church life, e.g., permitting women to be instituted as lectors and acolytes and the institution of the ministry of catechist. When this happens, the Gospel will be heard anew, our faith will be passed on more effectively, we will be renewed in our faith and our witness will become more authentic in our contemporary world.